World energy consumption projections expect coal to stay one of the world's main energy sources in the coming decades, and a growing share of it will be used in CTL, the conversion of coal to liquid fuels. Researchers from the National Institute of Clean-and-Low-Carbon Energy in Beijing and Eindhoven University of Technology have developed iron-based catalysts that substantially reduce operating costs and open the door to capturing the large amounts of CO2 that are generated by CTL. Their results are published in the journal Science Advances. To understand the significance of this achievement, some knowledge of the CTL process is required. The first stage is the conversion of coal to syngas, a mixture of carbon monoxide (CO) and hydrogen (H2). Using the so-called Fischer-Tropsch process, these components are converted to liquid fuels. But before that can be done, the composition of the syngas has to be changed to make sure the right products come out in the end – liquid fuels. So some of the CO is taken out of the syngas (rejected) by converting it to CO2, in a process called 'water-gas shift'. In this chain the researchers tackled a key problem in the Fischer-Tropsch reactor. As in most chemical processing, catalysts are required to enable the reactions. CTL catalysts are mainly iron based. Unfortunately, they convert some 30 percent of the CO to unwanted CO2, a byproduct that in this stage is hard to capture and thereby often released in large volumes, consuming a lot of energy without benefit. The Beijing and Eindhoven researchers discovered that the CO2 release is caused by the fact that the iron based catalysts are not pure, but consist of several components. They were able to produce a pure form of a specific iron carbide, called epsilon iron carbide, that has a very low CO2 selectivity. In other words, it generates almost no CO2 at all. The existence was already known but until now it had not been stable enough for the harsh Fischer-Tropsch process. The Sino-Dutch research team has now shown that this instability is caused by impurities in the catalyst. The phase-pure epsilon iron carbide they developed is, by contrast, stable and remains functional, even under typical industrial processing conditions of 23 bar and 250oC. 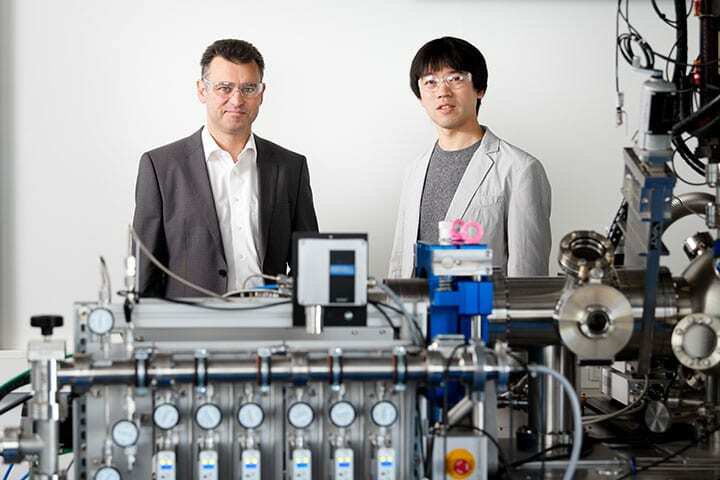 The new catalyst eliminates nearly all CO2 generation in the Fischer-Tropsch reactor. This can reduce the energy needed and the operating costs by roughly 25 million euros per year for a typical CTL plant. The CO2 that was previously released in this stage can now be removed in the preceding water-gas shift stage. That is good news, because it is much easier to capture in this stage. The technology to make this happen is called CCUS (carbon capture, utilization and storage). It has been developed by other parties and is already being applied in several pilot plants. The conversion of coal to liquid fuels is especially relevant in coal-rich countries that have to import oil for their supply of liquid fuels, such as China and the US. "We are aware that our new technology facilitates the use of coal-derived fossil fuels. However, it is very likely that coal-rich countries will keep on exploiting their coal reserves in the decades ahead. We want to help them do this in the most sustainable way," says lead researcher professor Emiel Hensen of Eindhoven University of Technology. The research results are likely to reduce the efforts to develop CTL catalysts based on cobalt. Cobalt based catalysts do not have the CO2 problem, but they are expensive and quickly becoming a scarce resource due to cobalt use in batteries, which account for half of the total cobalt consumption.